After something of an extended weekend for the teams down at the the Paul Ricard circuit in southern France, Beechdean AMR team returned home somewhat frustrated with the events of the opening round on Saturday. 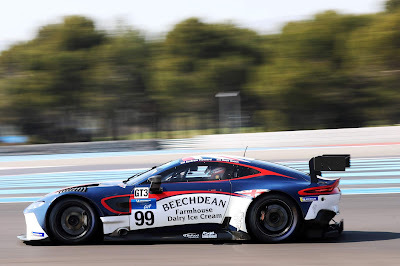 Having had the Wednesday of last week as the series official test (Prologue), the new #99 Aston Martin Racing V8 Vantage GT3 of Andrew Howard and Ross Gunn sat comfortably in the 'midst' of the ten car GT3 field time wise as they waited for their first race weekend to begin on Friday. Two Free Practice sessions interrupted by a Bronze drive collective test on the Friday formed the timetable ahead of Qualifying on Saturday morning and all appeared to be going well for the team before the #99 car was unable to participate in the FP2 session due to an unknown technical issue. Although Howard was later able to enter a time during his Qualifying (and a decent one it was as well) Gunn was unfortunately unable to submit a time of his own and therefore the car was relegated to the back of the grid for the Saturday afternoon race. As Howard tweeted before the race - "the only way was forward for the team". Having had rain affected sessions earlier in the meeting, at least race day was bright and warm as the cars formed on the grid ready for the two hour race - a race in which each driver must be in the car for at least 55 minutes. Howard was mandated to take the start but by virtue of being at the tail end of the pack he at least missed all the bumping and bashing as the pack manoeuvred their way around the opening twisty complex of the Le Castellet circuit - damage that can quite often see the early end to your race. A spinning LMP3 car soon into the race and just meters ahead of Howard was a timely reminder of what could happen in multi class - multi driver grade racing! Being a quick pedlar, Howard was soon picking off the slower GT3 drivers ahead as again it was clear that the Ferrari 488 runners had better top end speed along the Mistral Straight - faster than many of the LMP3 runners in fact. After 30 minutes of running Howard had made his way up to P6 and was having to sit just behind the 5th placed SPS Performance Mercedes AMG as the differences in these cars performances made it almost impossible to overtake. A spinning LMP3 car collecting the armco barrier just after the new pit lane entrance brought out the Safety Car but the trouble was where the Safety Car came out in the field as it split the GT3 runners allowing the leaders to come all the way around to the rear of the Beechdean AMR car - but almost a lap ahead! Just after going green, another stricken LMP3 car brought out the Safety Car again. That brought the cars into the available pitstop window and it was a mad dash into pit lane for most of the remaining 29 cars. By the time Gunn exited pit lane he remained in P6 but then came the penalties. Adjudged to have crossed a red light leaving pit lane, twelve cars were handed a two minute stop and hold penalty for this transgression (Safety Car out on track and nearing the location of the pit complex) of which the #99 car of Gunn was one of them. Entering into the final minutes of the race, some fortune finally came the way of the Beechdean AMR team with the front running #51 Ferrari getting a race destroying puncture and the #7 Scuderia Villorba Corse Mercedes AMG strangely losing a rear wheel in a period of full course yellow. Importantly for the team there was no obvious damage to the car as they make they way back to the UK in time for the first round of the British GT Championship at Oulton Park this weekend. The ACO now have more racing data for the Vantage GT3 so hopefully the performance parameters of the grids GT3 field will be further balanced in time for the next round at Monza on the 11th May. For Gunn there was to be further official sanction for his red light trangression in the form of a large bar bill to supply the team with a refreshingly cold beer after the race - and rightly so too! !